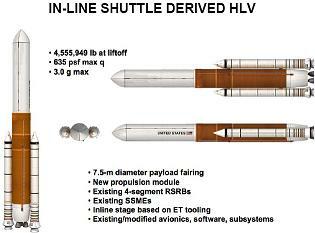 The Shuttle Derived Heavy-Lift Launch Vehicle (SD HLV) Assessment has been completed, the result of applying years of historical expertise from members of the Space Shuttle Program (SSP) and others into a follow-on vehicle. The focused effort over 15 months to create a post-shuttle masterplan has fostered HLV options that could be completed to a Block II Full Operational Capability for around $7.8 billion. Numerous studies into a follow-on replacement for the Space Shuttle – which utilizes the hardware, infrastructure and skill set workforce – have been created and presented over recent years, mainly based around two concepts; an inline launch vehicle and a sidemount vehicle. Such studies range back to before the Vision for Space Exploration (VSE) – which ultimately decided on the 1.5 architecture of Ares I and Ares V, via the 2005 ESAS (Exploration Systems Architecture Study). Alternatives to the Ares approach included the unofficial, yet highly public Direct team effort on a Jupiter Inline family of launchers and architectures, and an official – but behind the scenes – Sidemount effort, which became a larger team effort in late 2008. SSP manager John Shannon was able to publicly present the status of the preliminary Sidemount effort to the Augustine Committee’s review into Human Space Flight in 2009, covering a variety of disciplines, even as engineers continued to add and refine the Sidemount system. In late 2009, Mr Shannon requested the Inline SD HLV to be included in the analysis to provide a comparison with the Sidemount system. Sources note the Inline systems were developed independently by Mr Shannon’s team, as opposed to directly using the Jupiter vehicle blueprints, despite meetings between NASA officials and the Direct team members, and the great similarity between the architecture. NASA also requested for a trade study (HLLV Study) to be carried out on the HLV options, notably between the RP-1 booster, Sidemount and Inline systems. The SSP Assessment effort, however, ran independent of that study, but provided input. Work continued in earnest until President Obama’s 2011 budget was unveiled in February, which proposed the cancellation of the Constellation Program (CxP), but also the use of Shuttle-derived systems, with SSP given notice to shut down their HLV study activities by completing the documentation of their findings. The documented effort on the SD HLV was completed this month, resulting in an impressive – and highly extensive – 726 page presentation, which was acquired by L2. “The work was performed in response to questions from the 2008 Presidential Transition Team, the Augustine Committee’s ‘Review of United States Human Space Flight Plans,’ and a 2009 internal NASA assessment of Heavy-lift Vehicles. Subsequent to the release of the President’s proposed FY2011 budget in February 2010, HLV assessment activity was halted and effort began to document the preliminary results. The focus of the assessment – which concentrates on the Sidemount option – is based around a block transition of existing Shuttle hardware, for early flights using remaining assets left over after Shuttle, prior to the upgrading via new hardware and software. “Shuttle derived is the dominating factor that sets these studies apart from other similar assessments. This objective was to maximize the use of existing Space Shuttle skills and assets for developing and operating the HLV. This includes using the flight hardware, the flight software, the facilities, the processes and the skilled contractor and civil servant personnel that have been used successfully on the Space Shuttle,” noted the Executive Summary. As previously noted in memos on the ongoing studies, hardware availability allowed for the potential for around three flights of the Block I SD HLV. Extensive outlines on the actual stock count of SD hardware is provided later in the presentation. “The existing inventory of the certified flight hardware is sufficient to support three or more flights after the Shuttle’s planned retirement. The only major new development for Block I would be the Payload Carrier (PLC) that replaces the Orbiter on the side of the External Tank (ET),” the summary continued. Also key to the findings, the proposed HLV is part of a larger mission architecture, one which could provide additional support for the International Space Station (ISS) if required, mainly via cargo capability, but also via crewed versions of the vehicle, and on to Lunar mission support and beyond. The presentation also noted that the crewed HLV version would utilize the Orion in its original role of transporting astronauts into orbit and back, as opposed to the FY2011 proposal of an interim role only as a Crew Rescue Vehicle (CRV) on the ISS. “The HLV is primarily for cargo and provides an excellent foundational capability for heavy-lift. It can deliver 80 metric tons (mt) of gross cargo to Low Earth Orbit (LEO), 45 mt to the International Space Station (ISS), 30 mt to Geosynchronous Orbit (GEO) and 8-10mt to the lunar surface. The Executive Summary also reported the findings that the Inline version of a SD HLV is at a disadvantage to the Sidemount, based on schedule and cost and degree of infrastructure changes. However, while the presentation focuses mainly on the Sidemount, due to the late start to the Inline study, both versions – along with the potential to start with Sidemount, before merging into an Inline vehicle – are deemed to be feasible. “Late in the HLV concept definition studies, the HLV team was asked to evaluate an inline Shuttle derived HLV development with same approach and strategy to use existing Shuttle assets and compare those results to the side mount HLV,” continued the Executive Study. “The in-line HLV performance results were very similar to the side mount HLV since using the same number of Solid Rocket Booster (SRB) segments, the same number of Space Shuttle Main Engines (SSME) and propellant loads were basically the same. Block I development would take about two years or longer than the side mount. “Building the PLC for the side mount and adding a new thrust structure to house the SSME’s on the bottom of the ET for the in-line core stage would be a wash. The largest difference would be that the launch pad and the mobile launch platform (MLP) would require a launch tower for the taller in-line vehicle and considerable changes to the MLP and the Tail Service Mast (TSM) configuration. The summary also noted what is arguably the most attractive elements of a SD HLV-based transition; schedule, cost, and skillsets. Operational proficiency , a key aspect in flying safely and minimizing the gap in the current SSP operations team, is a critical driver and very perishable. Loosing the critical skills only to hire and train a new team seven years in the future could be very disruptive. 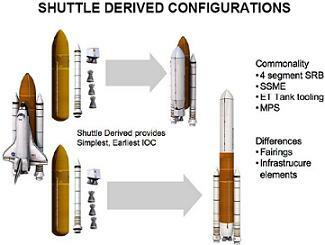 “These studies identified some major advantages in pursuing a Shuttle derived HLV capability as soon as possible. First, it retains the Shuttle infrastructure and critical skills needed to fill the gap in our nation’s human launch capability, and maintaining the United States’ leadership in space exploration. Interestingly, while the study team’s primary goal is to document the findings of the extensive studies, as opposed to enacting an effort that is currently opposed by the FY2011 proposal, an element of hope is noted for the documentation to become the basis of a commercial proposal for a HLV that would fit into President Obama’s outline for NASA’s future. “The intent in documenting the results of these HLV concept definition studies and analyses is to make this wealth of information available to the Shuttle contractors and the commercial space systems development and operations community to meet our country’s space exploration needs,” the summary added. With history back as far as the Shuttle-C concept, the Sidemount HLV is the most natural of the transitions from the STS design. 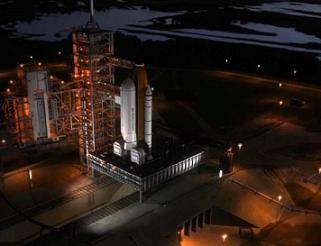 “The side mount HLV make extensive use of legacy Space Shuttle assets. The primary ascent elements of the SSP [ET, RSRB, SSME] are unchanged from their current configuration,” outlined the presentation. The first flight of the Sidemount HLV would have utilized the spare ET-94 tank, currently housed at the Michoud Assembly Facility (MAF) in New Orleans. This tank is a LWT (Light Weight Tank) as opposed to the SLWT (Super Light Weight Tanks) currently used by the Shuttle to achieve larger masses to be carried uphill. 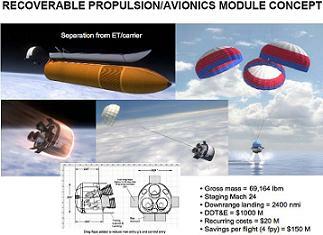 “The primary new element is the Payload Carrier with a payload envelope of 7.5-m x 30-m. The selection of a 7.5-m diameter was picked as the latest practical diameter that support future missions. Further analysis has shifted the focus to smaller lander designs for lunar orbit rendezvous missions and EDS designs based on a cluster of RL-10 class engines. Analysis of the use of a propulsion/avionics module was also conducted to provide a future option to recover “high value assets” following launch of the HLV – namely the SSME engine systems and avionics. “Because the staging point of the SSME propulsion is around Mach 17 for a J-2X upper stage or Mach 24 for an RL-10 upper stage, the module would reenter and land in the Atlantic Ocean. As referenced by the Direct Team’s Jupiter Inline vehicle concepts, this design also has a history reaching back as far as the Marshall Space Flight Center (MSFC) studies (1990s) to design a shuttle-based heavy lift cargo vehicle to compliment the Space Shuttle. Known as the National Launch System (NLS), the concept was deemed to have significant merit – before being deleted due to budgetary concerns. “The SSMEs and RSRBs are used unchanged. The propulsion module is positioned at the aft end of the in-line tank and the payload carrier is placed in-line above the tank,” noted the presentation on both commonality and changes. “Because of the axial and bending loads the in-line tank requires strengthening beyond that of a standard External Tank design. “In addition the forward LOX tank is redesigned from the ogive shape of the External Tank to a cylindrical tank section with elliptical domes. A fascinating mitigation of numerous infrastructure challenges would be to place the SSMEs/MPS on the side of the Inline vehicle, which would mirror the STS aft end on the current MLP and Pad. 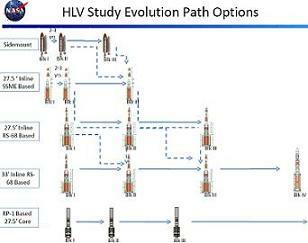 “An alternative HLV configuration was also examined late in the study period. This hybrid concept uses an in-line mounting of the payload at the upper end of the in-line Shuttle derived tank, but retains the SSME engine placement in the side mount position as on the Shuttle. “The intent was to define a low-cost, interim flight demonstration vehicle that allowed use of an existing External Tank and minimized infrastructure changes especially at the MLP. However, this concept also has challenges of its own, such as offloading propellants during a pad abort, and axial and bending loads on the intertank region. Suborbital staging to increase payload capabilities is a charge that has sometimes been cited in opposition to the ESAS findings, which – mainly due to the restrictive timeline of the study – was deemed to have only made a cursory examination of the SD HLV options, notably Sidemount. 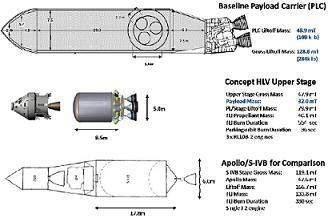 The design of the Upper Stage is a key element to the ability of the HLV, to conduct the mission of interest. 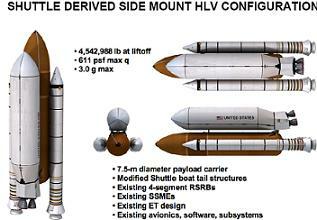 “The HLV has the capability of taking large cargo to an orbital or suborbital stage point. For a useful mission this cargo must contain the propulsion necessary to carry payloads to a final destination. 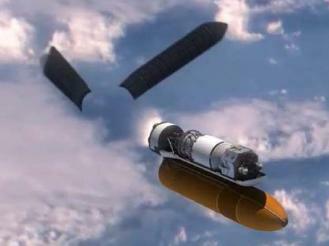 This propulsion element may be integrated with the payload, but usually takes the form of an upper stage. Examples of upper stages include existing and new designs. Engineers went back further into the history of the program for the Upper Stage evaluations, referencing the engine used during the Apollo era. “Existing systems were compared against mission needs and the original Apollo upper stage, the S-IVB, to highlight attributes of a successful configuration. The three block approach would apply to both the Sidemount and Inline vehicles, a building block design approach that was determined as the best way to minimize cost and utilize Shuttle assets. There are three blocks in total, with Block I including a Proto Demo Test Flight for the in-line configuration. “The Block I HLV utilizes existing Shuttle assets wherever practical. The first flights are based on a large inventory of existing assets including RSRB, ET, SSMEs, avionics and software and other subsystems. The RSRBs are used unchanged,” the presentation outlined. A large effort was placed into inventory analysis of existing and required systems for – at the very least – the Block I flights, along with ground rules and associated costs and procedures on contract awards. Key areas – such as available ET, SSME and SRB hardware – provided an interesting status review of overflow STS assets. A reference is also made to a decision that was noted by the all-powerful Program Requirements Control Board (PRCB) meeting in January of this year, where a proposal was put forward to delay the disposal of SSME assets, pending ‘future launch vehicle architecture’ decisions, which – as per the SD HLV presentation – now appears to have been an extension to the ‘feasibility’ of SSME production restart. In total, 15 SSMEs are expected to be available at the end of the current Shuttle manifest, along with two development engines. 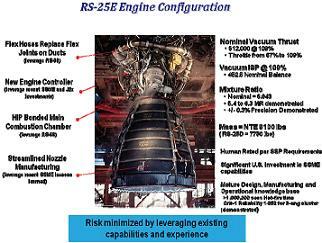 A reference is also made to a new version of the SSME, called the RS-25E, which aids the HLV benefits via lower costs. With the Block I HLV utilizing the current four segment design SRB/RSRM, minimal impact is noted for ATK to support the transition. Also, the Block I flight profile mirrors the Shuttle, allowing for minimal changes to elements such as avionics and recovery systems. The buckling issues are also referenced for the Block II vehicle, which may become worse if the transition to a five segment SRB is taken for the upgraded HLV. 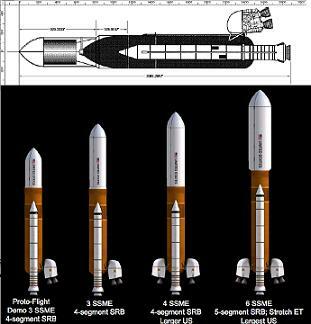 “If five-segment solid rocket motors are required for heavier lift purposes, on-pad loads for SSME buildup and abort shutdown become a bigger concern. Preliminary estimates indicate loads increases of ~18-23% for the aft booster assembly. This would impact the aft motor case joints, case buckling limits, and the aft skirt. A significant analysis effort would be required to determine if there is adequate structural margin and a structural test would be a certainty. One subject which has already been covered extensively – due to the previous Shuttle Extension studies – was the spare External Tank inventory. 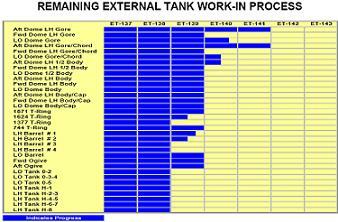 As previously know, several spare tanks are at various stages of production. However, the HLV presentation documents their build-state for the first time. 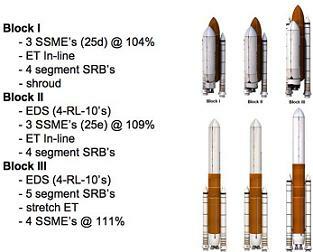 The graphic confirms ET-139 is at an advanced stage of structural completion, especially compared to ET-140 and ET-141. Also, the key driver to the delivery of a new external tanks – claimed to be as late as 2013, due to the certification of a new Thermal Protection System (TPS) foam – BX-265 – is nowhere to be seen in the HLV documentation. Huge amounts of data are presented via computational models and analysis, based mainly around the cargo and manned versions of the Sidemount HLV. Other bodies were also brought in to lend their experience to the assessment, such as the Aeroscience and Flight Mechanics Division, who supported the on-pad and in-flight aborts for an Orion crew vehicle riding with the Sidemount HLV. Several references are made to the three-degrees-of freedom Program to Optimize Simulated Trajectories (3DOF/POST) analysis methodology, which is an industry standard, again thinking in advance to a potential transition of the SD HLV concepts to a commercial company. The Langley Research Center (LaRC) were also tasked with aiding analysis on pad aborts for the HLV married with Orion – gaining another large set of data points in the presentation. The experience of the SSP workforce – who have effectively flown a version of the SD HLV via the STS over 130 times – can be seen throughout the presentation, with available computational and historical models on elements such as the External Tank providing accurate data points for expected conditions for the HLV. The experience base with STS also comes into play with the costings of the vehicle, with the HLV development and recurring cost estimates are based on the actual historical costs for the same elements used by the Space Shuttle Program, with complexity factors applied to modifications of existing subsystems that are similar to those currently used on the Shuttle, and engineering estimates for the new developmental items. 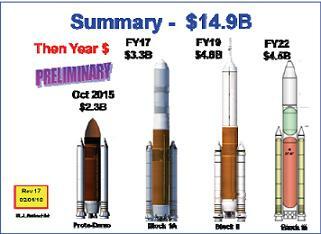 “Since these cost estimates are anchored to well-defined historical data, they should have higher confidence levels than similar cost estimates for new developmental launchers,” opened another extensive element to the presentation. “The major new development element for side mount Block I HLV is the Payload Carrier which includes the Payload Shroud, Strong Back Keel, and Boat Tail containing the propulsion, power, and avionics subsystems. For the for side mount Block II HLV, the major development items include a lower cost, RS-25E variant of the SSME, a new avionics and software suite, non-toxic electric APU, EMA-driven MPS cryo valves, and the EDS. The cost estimate, the figure which is one of the key points of support for a transition to SD HLV, comes in at $7.8 billion dollars to get to the point of FOC (Full Operational Capability) of a Block II HLV, a fraction of the cost of Ares. To get to Block I first flight the development cost is only $2.7B. “The total side mount HLV development cost to reach a full operational capability was estimated to be $7.8 billion (plus about $1B cost to develop the EDS), with an overall development period through Block II of 72 months. 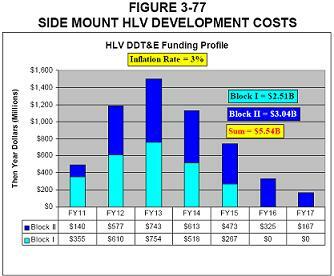 The Side Mount HLV development costs are estimated to be less than $8B for the initial Block I plus the upgrades to Block II. Once developed to FOC, the estimated reoccurring cost of the HLV varies between a NASA run and a commercially run vehicle (and/or a NASA/Commercial co-effort). 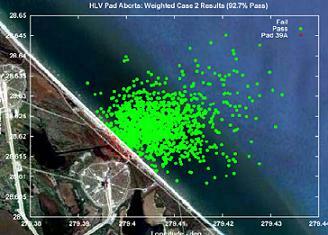 A flight rate of six launches per year is used in the example. 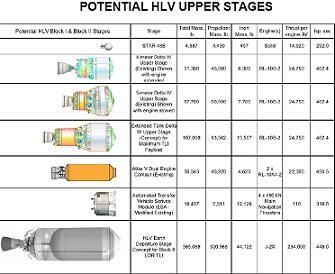 “At a flight rate of 6 launches per year, the estimated cost for each HLV launch would be $600M (fixed year $2009), once the side mount Block II HLV has become fully operational. The bottom (green) curve would apply to a fully privatized management approach, reflecting the significant recurring cost reductions possible by operating HLV on a commercial launch services basis. “These cost reductions result from utilizing standard aerospace commercial processes to streamline the contractor program management, sustaining engineering, production, and operations costs, along with minimizing the institutional and other direct costs associated with NASA oversight. The Inline estimates show where Sidemount holds an advantage, although the presentation cites an in-line HLV development program for the Proto-Demo, Block I, and Block II and Block III configurations over a 12 year timeframe. “This would be the budget required to develop the in-line HLV assuming full funding each year starting in FY11, including the effects of inflation at a rate of 3.0 percent per year. The total in-line HLV development cost to reach a full operational capability was estimated to be just under 15 billion dollars, including the cost to modify the ground operations facilities at KSC and the cost to develop the EDS. The total cost of $14.9 billion is placed into context when the costs to Block III for the Sidemount SD HLV is shown, with the presentation citing a total cost of $11.2 billion up to – and including – FY2020. The bottom line for the availability of the Sidemount HLV shows the first flight of the Block I in FY2015, with Block II’s first flight in FY2017. The Block II version of the Inline HLV is cited as FY2019. “The Block I version would take advantage of existing inventory of Shuttle assets to minimize the time to first flight, lower development risks, and reduce costs. The Block II version would replace the existing Shuttle elements and subsystems with newer, lower cost technologies as existing inventories are consumed. “Because many flight-proven Shuttle elements are used largely unchanged (RSRBs, External Tank, SSME, subsystems), the development can be expected to proceed rapidly. Reuse of existing flight software precludes an entire software development effort, which often becomes the schedule driver in new development projects. “The major development item for the Block I configuration would be the Payload Carrier which includes a large Shroud, Strong Back Keel structure, and a Boat Tail with propulsion, power, and avionics subsystems. 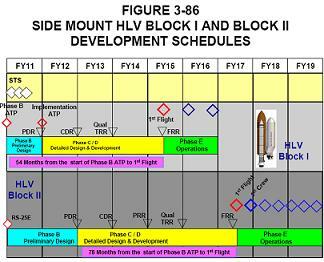 Estimates of the STS Program inventories indicate there would be sufficient residual Shuttle hardware to support 3 to 5 Block I HLV flights, depending on the subsystem. Notably, the infamous schedule “Top Risks” show no RED concerns, unlike the latter years of Ares, which was plagued by numerous RED concerns in schedule Top Risks, ultimately playing a role in its proposed demise. The next article will cover the mission profiles a SD HLV would be tasked with, from ISS to Lunar.